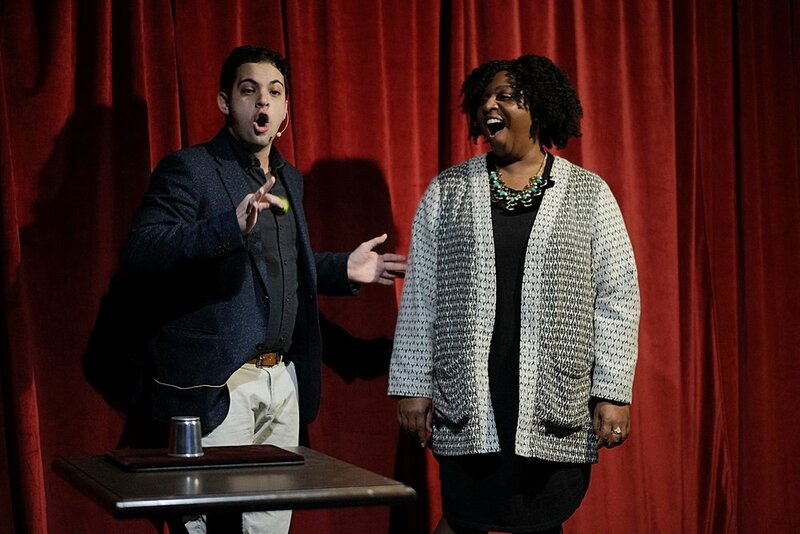 Last week, I took part in a special year-end show put on by The Toronto Magic Company to celebrate the holidays and the end of another season of their open mic show, The Newest Trick In The Book. Over twelve magicians appeared including Marc Correia, Keith Brown, Jonah Babins, Ben Train, James Harrison, Ryan Brown, Glenn West, Chris Mayhew, Leigh Beadon and Edward Gabreal. I got a few photos of myself courtesey of David J. Fulde. On Tuesday night, I gave an impromptu performance at The Newest Trick In The Book, put on by the Toronto Magic Company and hosted by the charming Jonah Babins. I had just come from another event and had been asked to step in for another performer who couldn’t make it. You can see photos from the event from David Fulde here). The Endless Chain is an old crooked gambling game. As Whit Hayden and Chef Anton described in their monograph on the subject, the most difficult thing to do while presenting the Chain is to convince people that it’s actually possible to win. Normally it’s presented as a piece of close-up magic (and you can imagine it would be much clearer if you could be sitting around watching the chain from above). But from the composition of the rest of the show, which was heavy on card magic, I opted to switch to this, literally on the walk up as I was being introduced. But it felt true to the rules of the Newest Trick as it’s something I’ve never performed in that setting before. I got some wonderful photos to share courtesy of David Fulde. There are two shows left before the end of the year. (I’m scheduled to appear on December 4 with a trick I’ve never performed before.) They’re free to attend but have limited seating, so you can reserve a spot in advance. Toronto’s lighthearted, warm fun and friendly magic open-mic night returned form its summer break last night at the newly moved and renovated See-Scape. You can see the new, expanded stage in some of the lovely photos from David Fulde. I was invited to appear on the first show of the season with Chris Mayhew, Harry Zimmerman, Graeme “Graemazing” Reed and the lovely and charming host Jonah Babins. The show continues weekly through to December and is a wonderful (free) opportunity to see magicians experiment, take risks and walk outside their comfort zones. Magic and Martini continues through November in Toronto and Oakville. Readers of this blog can use the code secrets for a discount on the prices of tickets when purchasing online.